Improve your home’s appeal and value with new flooring from our local store. We carry one of the area’s largest selections of outstanding laminate flooring in Marrero, LA. With countless options to choose from, deciding on the perfect option for your house may seem a bit of a challenge. However, our in-store associates assist you through the entire selection process. That way, your shopping experience is both easy and enjoyable. More and more homeowners we encounter are in search of floors that embody the perfect balance between practicality and beauty. For clients like this, we frequently recommend laminate floors. Designed to resemble popular floor fashions and manufactured with durable materials, laminate is ideal for even the busiest households. Not only does it hold up the way you desire, but it also delivers a level of style guaranteed to enhance any interior design. Today’s modern laminate flooring perfectly replicates the look and feel of other high-end floors. From natural stone tile to solid hardwood planks, laminate comes in so many varieties to match your tastes. Each of these products is uniquely textured, allowing it to resemble the original material to the touch as well. Once placed in the home, no one but you has to know it’s not the real thing. You can depend on us to help you navigate the many laminate floors we carry, as well as help you decide which option is perfect for your upcoming home improvement project. Whether you want to replace the floors in a single room or install gorgeous laminate floors throughout the entire house, laminate always proves itself as a wise choice. 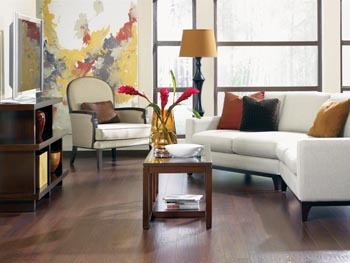 Enjoy the look of stone, wood, or ceramic floors with the price tag and maintenance needs of laminate. Laminate floors are innovative products that are made to imitate the appearance of real wood, stone, marble, and other stylish materials using 3D printing technology. You’re able to improve the ambiance of any room while appealing to your sense of style by installing this type of floor. Many people choose these floors with printed images and textures of natural stone, wood, or marble because of their lower maintenance requirements as well as their affordable prices. Unlike many types of natural flooring materials, laminate is easy to keep clean by regularly sweeping and mopping with a mild cleaning solution. It is water-resistant, stain-resistant, and able to withstand heavy foot traffic and activity while looking like virtually any material you desire. In addition, laminates cut down on the chances of water damage to your subfloor. Laminate flooring doesn’t crack or allow water to penetrate it because the only place for water to penetrate to the subfloor is at the seams. However, with proper sealing and installation by our team, even the seams are protected against water, spills, and other sources of moisture. Provide the best look and protection for your home by choosing stylish and protective laminate floors. Even the highest quality floors fail to satisfy in appearance and performance when installed poorly. To prove our commitment to your satisfaction, we provide quality installation services along with quality products. Our team of trained technicians is prepared to handle your laminate flooring installation with the utmost speed and skill as soon as you make a purchase. Utilizing trusted techniques and resources, they complete even the most comprehensive jobs in a timely manner. Every installation we complete is backed by the Ultimate Confidence Guarantee. This guarantee is a promise that if you are unhappy with any of our 4- or 5-Star rated floors for any reason, you don’t have to worry about a wasted investment. As long as you contact us within 30 days of the initial install, we’ll replace the flooring with a similar product free of charge. Utilizing our installation services is especially important because many manufacturers’ warranties only cover replacement or repair if your flooring was installed by a qualified professional like our specialists. By allowing us to install your floors, you have the benefit of properly installed flooring backed by our warranties as well as the knowledge that should anything happen in the future, you’re more likely to be covered by the manufacturer’s warranty as well. Contact us to find out more about our laminate flooring options. We proudly serve the communities of Marrero, Westwego, Avondale, Harvey, and the New Orleans Metro area of Louisiana.